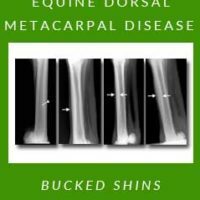 Equine Dorsal Metacarpal Disease — Bucked Shins | SynNutra, Inc.
Equine dorsal metacarpal disease, commonly known as bucked shins, affects at least 70 percent of horses in Thoroughbred horse racing. It is a painful condition that, once developed, requires horses to rest more and/or train less. Even after initial healing, 12 percent of affected horses will later develop cortical stress fractures, which present a significant risk of catastrophic injury. To date, bucked shins develop, at some level, with any training method. Because of the high number of racehorses that develop bucked shins, it is estimated that this disease costs the horse racing industry over $10 million annually. Bucked shins are caused by repeated bending forces, or stress cycling, of the third metacarpal bone (MCIII, cannon bone). These forces are necessary to stimulate the body to remodel the bone so it can become strong enough to handle the forces applied during racing. The cannon bone starts with a relatively thin cortex, Fig. 1, and must remodel, or grow, into a thick cortex, Fig. 2. Problems arise when stress cycling outpaces the body’s ability to remodel, eventually leading to stress fatigue and bone damage. Fig 1. Shin of a young Thoroughbred racehorse that has just started training. The arrows indicate the relatively thin dorsal cortex. Fig 2. Shin of a healthy, racing-fit Thoroughbred racehorse. The arrows indicate the relatively thick dorsal cortex that has developed after months of training. Fig 3. Shin of a Thoroughbred racehorse. The arrow depicts a cortical stress fracture of the shin. Bucked shins are most common in young, developing racehorses, typically 2 to 3 years old when they begin advancing in their training. However, they can develop in a racehorse of any age when they begin training and are not bone-fit. Once trained, fit horses reach the age of 5 years, they are usually out of danger of developing equine dorsal metacarpal disease. An early sign of bucked shins can appear as mild heat over the shin area. This will usually develop into an obvious swelling and sensitivity to digital palpation. As the condition progresses, horses may show notable lameness and/or a reluctance to train. Advanced cases will often progress into stress fractures and can cause severe lameness. Radiographs will determine the severity of the condition and should be repeated serially over time to monitor healing and remodeling progress. See Fig. 3. Treatment of bucked shins is most often in the form of training management that allows the remodeling process to catch up with the damage caused by stress cycling. This consists of short periods of rest, followed by slowly increased levels of exercise. Over the years, numerous other methods have also been utilized. Historically, pin-firing has been used for many race horses. It consists of burning a pattern of holes through the skin and into the periosteum (the soft, outer layer of bone) by applying a red-hot pointed iron to the front of the cannon bone. Pin-firing is not used as much as it once was, and is considered by many to be antiquated and even barbaric. Extracorporeal shock wave therapy is commonly used either alone or in combination with bisphosphonates (Tildren TM , OsPhos TM and other osteoclast inhibitors). Veterinarians have mixed results with these therapies, and there are long term safety concerns with bisphosphonate use. Cortical fractures are often treated by surgical techniques, including lag screw fixation, Fig. 4, and osteostixis. As its name implies, lag screw fixation is placing a screw across the fracture line to provide compression and stabilization. Osteostixis is drilling multiple holes across the fracture line to stimulate bone healing. Both of these techniques are generally effective but require 5 to 6 months out of training. Fracture recurrence is common with both techniques. More importantly, treatment protocols have been developed that are more effective without surgery. Supplementation with nutrients that effectively stimulate osteoblast (bone producing cells) activity and regulate osteoclast (bone resorbing cells) activity can shorten recovery time for cortical shin fractures, especially when coupled with shockwave therapy. With this method, horses usually return to jogging in 2 to 3 months. Depending on the severity of the fracture, some are completely healed in this timeframe. Racehorses managed with this method typically race again in 5 ½ to 7 months. Training methods are very important in the prevention of equine dorsal metacarpal disease. In his article, On Bucked Shins, Vol. 48 of the 2002 AAEP Proceedings, Dr. David Nunamaker makes a strong argument for properly remodeling the cannon bone through modified training techniques. Dr. Nunamaker prescribes an early introduction of fast works at short distances added to the end of gallops. While many successful trainers would argue that these methods are unreasonable, it makes sense to consider modifying the traditional training approach. Training must be modified to fit the individual racehorse and its unique needs as there are many issues to consider when preparing a racehorse for competition. Regardless of the training method, bucked shins continue to be a significant problem in nearly all Thoroughbred racing stables. However, with specific supplementation early in the training process and individualized training, one can nearly completely eliminate the occurrence of bucked shins.